Did you know that Papaya, green Papaya that is, is great for the skin? 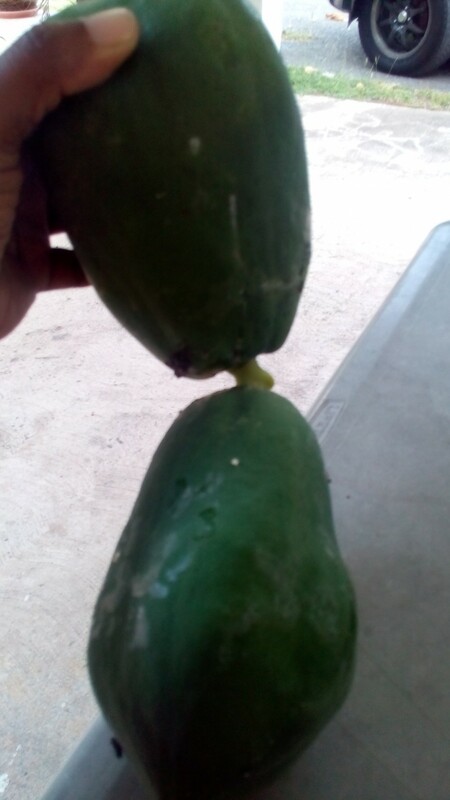 Papaya (carica papaya) is a wonderful fruit that is great when ripe as a sweet treat or green to be used in stews. But the papaya is a wonderful fruit that has many beneficial properties. The papain in papaya is found in its highest concentrations when the fruit is green. Here is where the wonders of the fruit abound! The papain found in papaya has many attributes for skin care such as a treatment for ringworms, psoriasis, used as a poultice to help aid with wounds, burns and stings. The papain is also a great at helping to exfoliate the skin. So it is with this in mind that I often go back to nature to find other ways of creating great skin care products. I decided to revive a very popular product, Island Cream and do a 2016 version. Of course, the main ingredient in this particular product is the green papaya juice. This product is great for helping to exfoliate the skin and smoothing rough, dry patches found on the elbows and heels. What is papain? “Papain is an enzyme that is found in green papaya (papaya that is not quite ripe). It has been used in traditional medicine for thousands of years because of its many health benefits which include treating wounds and cuts, stings and burns and internal illnesses.” Read More Papaya is not one of my favorite fruits to eat, but for skincare, it is a powerhouse. I respect it as much as I respect Turmeric for skincare and overall holistic care. So it was with that that I began using the juice from the Green Papaya in rich, decadent butters and creams for myself and my customers. A few days ago I decided to take another look at a recipe I had created and made many, many years ago. You can see how I juiced the papaya on my Instagram (@itibabeauty) page by clicking here. At the end of the pictorial tutorial on “How to Juice a Green Papaya” you see the end result was the whipped body butter. This product, or any product made with Papaya enzymes, is a great way to slough away hard to remove, dry skin. And it leaves you feeling so smooth! I am still refining the recipe and considering a re-launch of a new and improved version of this cream.